His boss, Ruentex Group chairman Samuel Yin, says of him: "He's like a 'wolf king,' leading a pack of always hungry wolves around China staking out territory hunting for prey." One of his suppliers, the chairman of Daphne International Holdings Ltd. Eddie Chen, speaks of him respectfully. "He's the 'leader of the team,' the key man in the performance of this Taiwanese team in the major league market of China." "He" is Peter Huang, chief executive officer of RT-Mart China. RT-Mart China's parent company, Sun Art Retail Group Ltd., created a stir in July 2011 when it listed on the Hong Kong stock exchange and saw its share price rise 47 percent on the first day it was traded. The listing was later named by the prestigious financial journal FinanceAsia as "Best Equity Deal, Best IPO" in 2011. Huang's aggressive strategy has helped RT-Mart catch up to and overtake its more vaunted retail megastore rivals Carrefour SA and Wal-Mart Stores Inc. in China. When Huang opened the first RT-Mart in Shanghai in 1998, it was the last of the 10 biggest foreign-invested retail chains to gain a foothold in the burgeoning market. Ten years later, because of Huang's exploits, a new king of the hill in China's retail sector had emerged. RT-Mart China squeezed past Carrefour and Walmart in 2009 to claim the mantle of market leader among China's foreign-invested retailers. That edge has only grown in recent years. In 2011, RT-Mart China had sales of 61.6 billion renminbi (US$9.74 billion, NT$288.6 billion), leaving Carrefour (45.2 billion renminbi) and Walmart (43.0 billion renminbi) in the dust. Huang's influence in China's retail industry is omnipresent. As of the end of May, his company had 190 stores in China, and it expects to raise that number to 220 by the end of the year. At present, only a handful of hypermarket operators in China are making money, and Carrefour and Walmart are not among them. Industry insiders estimate that a hypermarket in China needs annual sales of more than 200 million renminbi just to break even, a target that may be imposing for many but not RT-Mart, whose stores average annual sales of 330 million renminbi. This success begs the question of how Huang has built his seemingly invincible RT-Mart retail empire and how he has acquired his impressive retail industry skills. The slim, fair-skinned Huang does not appear physically imposing, but when he speaks, his narrow eyes radiate shrewdness. Hard as it is to believe, this scholarly looking man is as accomplished on the factory floor as he is on the store floor. Starting as a workshop foreman, Huang toiled in factories for more than 20 years. Before he took the plunge into the retail world, he was the general manager of Ruentex's core textile business, Ruentex Industries Ltd. At a time when there was little opportunity for growth in the textile contracting business, Huang was ordered in 1997 to assess the Ruentex Group's possible move into the retail sector, starting him on a journey that continues to this day. Huang's unusual upbringing has contributed to his ability to do well at anything he takes on. The 57-year-old grew up in a farming village in Tainan, and when he was not busy working the land, he was in charge of staying on the lookout when the grown-ups gathered to gamble. His experience around the gambling table gave him plenty of insight into human nature at an early age. When the village's harvests were poor, Huang and his seven siblings never knew for sure where their next meal was coming from. As a result, Huang has always made the most of any chance to eat. "Even today, whenever I have a meal, I usually eat too much," he says with a laugh. But because of his childhood, he cherishes every moment far more than others. He later made it off the farm and studied at a vocational high school and vocational college before getting an MBA from National Taiwan University's College of Management. When it came time in one class for Huang to make a presentation to his classmates, he talked about the textile sector – the "hot" industry at the time. Fellow student Samuel Yin found himself nodding in agreement at much of what Huang had to say, so much so that after class, Yin invited him to work for Ruentex Industries after he graduated. Ask Huang why an outsider to the retail business has so skillfully managed megastores, and he immediately answers with the saying: "By building your cart behind closed doors and smelting your iron by hand" (in other words, by doing things your own way). "You won't believe this when I tell you, but the management and human resources systems I'm using now were all brought over intact from Ruentex Industries when I made the move," Huang says in a hushed voice, as if revealing a secret. Not having a background in retailing was actually a blessing, Huang explains, because he was not locked into to a conventional framework of how things should be done, making it easier to introduce management approaches from the manufacturing sector. In his journey from the factory floor to the store floor, Huang has benefited from the guidance of two "masters." Ruentex Group founder Yin Shu-tien, Samuel Yin's father, was the first. He had a habit of asking employees about their recent performance whenever he ran into them, and he wasn't asking simply to make conversation. Huang remembers how the elder Yin would ask the production manager about the plant's output and then ask the sales manager about the latest orders. If one of the answers he got was positive and the other negative, Yin would dig further to find out the truth. "When there's a problem, you need to ask more than one person. You can't simply listen to one side of the story," Huang says, recalling the lesson Ruentex's founder taught him. The "master" who guided Huang in the retail sector was Kanji Kirima, the Japanese founder of a small chain store. Under RT-Mart's human resources system, Huang personally interviews all store managers and speaks to them at least three times – before their training, after their training, and before they get promoted. After the final interview, Huang gives each employee a piece of paper listing management principles. It includes a total of 11 items, including "pricing decisions are at the root of managing" and "managing depends on your will." Huang came across the list when he first got started in the retail industry and was in Japan to study the tricks of the trade. Through an introduction, Huang made contact with Kirima to ask for his guidance. Just before he was about to leave after having gained a lot of insight from the Japanese businessman, Huang noticed the list hanging on the wall of Kirima's company, and he made a special request to get it. Another of Huang's talents is that he's a sponge for information, constantly learning and assimilating expertise from both East and West. The head of a Chinese retail association once ran into Huang at a meeting and asked him, "Do you know how people see you?" Holding Huang's hand, the person said, "(They say) you will win because you have the Western management knowledge that we lack and an understanding of Chinese culture that foreigners lack." 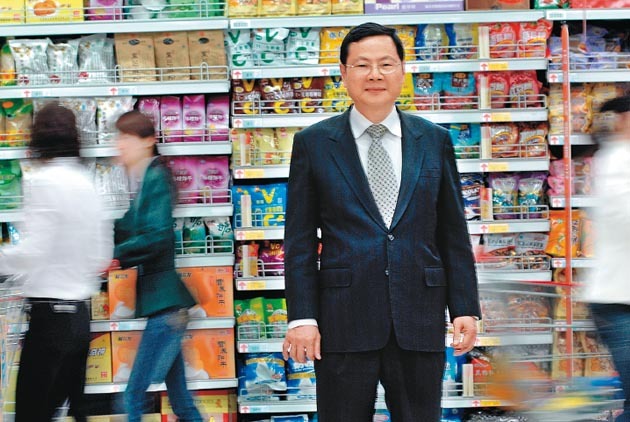 One of RT-Mart China's unique competitive advantages is Huang's innate ability to select store locations. Since starting in China in 2001, Huang has rarely taken time off and has not had the chance to hone his golf game, instead flying around China on weekends and holidays to get a look at potential store locations. "To date, I've already been to about 1,000 Chinese cities," he says. His suitcase is always packed with short-sleeve shirts and heavy jackets, leaving him prepared to fly north or south at a moment's notice. Through his many travels, he has developed a nose for good locations that go beyond objective indicators such as population and income. Among the other keys, he says, are things like traffic and parking convenience, the strength of rivals in the area, and the tastes in food and clothing of local consumers. "There are many things you can only get a feel for by visiting a potential store site," he says. Huang has a few other tendencies when he evaluates a potential store location. He usually travels alone, without notifying anyone. If people from RT-Mart's store development department accompany him, they are not allowed to share with him any additional information. "I go to a site to look and get a feel for the place, not to listen to others," Huang says, explaining that he doesn't want his judgment colored by outside interference. Because of Huang's personal involvement, 60 percent of RT-Mart hypermarkets generate 200 million renminbi in revenues in their first year, reveals RT-Mart China chief financial officer Hsu Sheng-yu. "Those numbers are driven by Chairman Huang himself. We are both fast and precise, unlike other foreign-invested companies that rely mostly on hard indicators (to choose store locations) and have to report any move through layers of bureaucracy," Hsu says. "There are several factors that determine whether a store makes money, but choosing the right location is at least half of it," adds Hsu, who also serves on the RT-Mart committee that appraises sites for store development. Huang's dedication sets the tone for the rest of the company and even RT-Mart's supply chain. "Once you've had a chance to work with Chairman Huang, you can never break the bond. He uses all of his time off to visit stores. This strong fighting spirit is contagious. It makes you want to do your best to give him the best possible support," says Gu Haiming, the chairman of Changshu Haiming Contemporary Agriculture Co. Ltd., RT-Mart China's biggest supplier of fresh fruit and vegetables in eastern China. Gu is a prime example of Huang's strategy to buy goods at their source. The contract farming arrangement between RT-Mart China and Changshu Haiming ensures that the retailer gets produce that is fresh and inexpensive and offers the supplier preferential payment terms and no-interest loans. This farmer-retailer partnership model has been widely copied in China's retail sector in recent years. Another of Huang's keys to success is staying "hidden." The inherently low-key Huang has also insisted on the importance of keeping a low profile in China's business environment. He has barely done a handful of interviews since launching his retail business in China, and RT-Mart China has never advertised. When Harvard Business School wanted to write a case study on the retailer, the company declined. "An important key to RT-Mart being able to make it this far in China is its low market visibility," Huang says. Compared with its much more prominent rivals Carrefour and Walmart, which consistently find themselves in the spotlight whenever the media discusses consumer issues or the service industry, RT-Mart has skillfully remained "hidden" behind the scenes. Arriving in Gaoxin District in Suzhou, about an hour and a half outside Shanghai, you can't miss the Hushuguan Industrial Park. The park's towering factories and logistics centers are all identified by eye-catching company signs – except for one. A huge building occupying an area equal to that of the Daan Forest Park in Taipei reveals few clues about the structure's functions or who owns it. All an outsider sees are a few warehouses with white walls and blue roofs and a fleet of big trucks shuttling back and forth around them. Even the red and blue trucks reveal little, not even displaying the name of the company that operates them or its logo. In fact, the facility is RT-Mart China's logistics center for eastern China. Nelson Liu, RT-Mart China's logistics president, describes it as the biggest logistics complex in China and the logistics hub for 92 RT-Mart hypermarkets. It handles 300,000 cartons of merchandise a day and is served by a company-owned fleet of 150 trucks. Entering a warehouse that covers an area equal to eight soccer fields, you pass a two-story-high row of shelving every few steps. People pulling items or taking inventory, either on their feet or driving forklifts, are busy at work. Each employee has a barcode scanner and each forklift a touch-panel microcomputer the size of an iPad to record electronically what's coming in and what's going out. When Huang discusses his low-cost strategy, his favorite phrase is "KISS," or "Keep it simple, stupid," and it applies as much to RT-Mart's logistics operation as to any other part of the business. Taking inventory or recording items being received or shipped all rely on a small barcode, and all employees have to do is scan it. The simple procedure has minimized mistakes. Milan Chiang, the chief executive officer of Very Technology Co., says RT-Mart's product labels reveal the company's logistics and information technology prowess. The information on the label incorporates space management, inventory management, time management, product classification and specific product information. At distribution points, the labels also include delivery information. "RT-Mart's rapid development in recent years has really depended on mastering this 'last mile,'" she says. According to Liu, Huang knew from the beginning the importance of support platforms, including for logistics and information flows, and he decided to make a big investment in this area early on, when RT-Mart China opened its 18th store. "In the future, we plan to have a logistics center in every province," Liu says. Today, RT-Mart has emerged unequivocally as the biggest foreign-invested retailer in China, yet Huang continues to follow the same schedule he adopted when he first got involved in the retail business in China in 1997, traveling around the country every weekend and holiday checking on stores and selecting new sites. The day he was interviewed by CommonWealth Magazine, he had just returned to Shanghai from Huaihua in the Xiangxi Tujia and Miao Autonomous Prefecture in southwestern China. "I'm used to it. If you have passion, you have a fighting spirit. Also, there a lot of people chasing after us," says Huang spiritedly, his enthusiasm getting him on his feet and moving as if he were running, head looking back at his pursuers. But at that moment, his expression is full of pride, knowing he and his company remain the leaders of the pack.